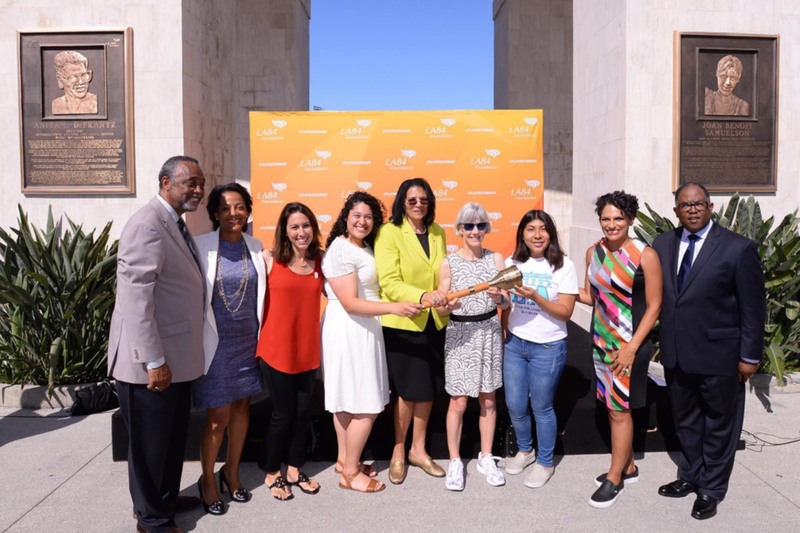 Today, the LA84 Foundation and Mark Ridley-Thomas of the Los Angeles Memorial Coliseum Commission welcomed Olympians Joan Benoit Samuelson and Anita DeFrantz into the Coliseum’s esteemed Court of Honor. Benoit Samuelson won the first ever Women’s Olympic Marathon in the 1984 Summer Olympics. DeFrantz, who played a vital role in bringing the 1984 Games to Los Angeles, is not only LA84 President Emeritus and a member of the IOC, but a bronze medalist in rowing in the 1976 Games. Located at the historic Coliseum Peristyle, the plaques that comprise the Memorial Court of Honor commemorate outstanding persons or events, athletic or otherwise, that have had a definite impact upon the history, glory and growth of the Los Angeles Memorial Coliseum. Joan Benoit Samuelson and Anita DeFrantz are the first individual female athletes commemorated in the Court of Honor since 1961, when Mildred “Babe” Didrickson was honored. For a complete list of all those individuals and events commemorated, click here. Next Watch the Coliseum Peristyle Restoration in Real Time!